What Are We Teaching Others? 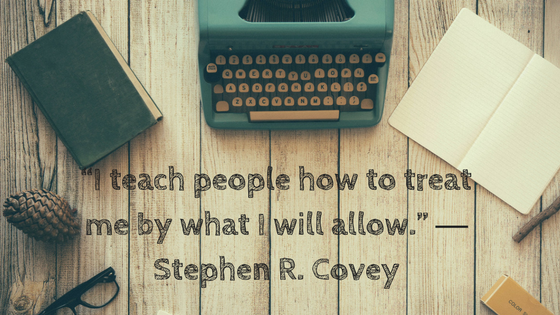 We teach others how to treat us based on how we treat ourselves and as Stephen Covey said what we allow. As an example… Lately I’ve had some struggles in some personal relationships. Struggles where it’s felt as though my feelings, my energy, and my time were being taken advantage of. I could place blame on others. I could say it’s just a symptom of the “good girl syndrome”, the change in weather or the phase of the moon. I could point fingers in all sorts of directions, but you know what? I really have no one to blame, but me. I’ve made it OK by not saying, “Now’s not a good time.” when my energy and my bandwidth has been low. I’ve made it OK by ignoring my own need for support. I’ve made it OK by keeping my thoughts and my feelings to myself. While I know that I can’t control how people react or respond, there are some things I can do (and have done). Things that ensure my time, my feelings, and my energy aren’t being taken advantage of. I’ve started with me first and foremost. I can’t expect anyone to respect my time, my energy, or my feelings if I’m not. This is not a “do as I say, not as I do” situation. Which means paying attention to what I need and what I’m feeling. If I’m in need of support, I’m letting others know by asking for it rather than expecting them to be able to read my mind or my cues. If I’m feeling run down I’m taking time to recharge before I commit to doing anything else. In addition, I’m saying, “no, thank you” when I don’t have the time, when I don’t have the energy, or when I’m tempted to do something because I’m feeling obligated. I’m also setting some boundaries around what I won’t allow in my personal relationships, such as negative, gripey type conversations (not to be confused with venting). Which also means that I’m watching my own contributions in a conversation. It’s not OK for me to gripe if I don’t want to listen to someone else do so. My friends, I invite you to take inventory of how you treat yourself and how others treat you by answering these questions. Do you respect your own feelings by not ignoring them? Do you respect your own energy by not expending when you don’t have much? Do others respect your time? Do others respect your feelings? Do others listen when you’re sharing your thoughts? If you answered “no” to any of these questions, what are you teaching others based on what you allow and how you treat yourself? What needs to change starting with you? I’m sorry (not sorry) for the barrage of questions. Hopefully they’ve helped to create some awareness and ultimately some options for change. Because at the end of the day, we truly do teach people how to treat us so let’s teach them well.